Welcome to the Canadian Rockies Ski Planner, your guide to downhill and nordic cross-country skiing, resorts, hotels, lodges, and winter activities in Banff and the Canadian Rockies. Unsurpassed beauty, outstanding winter facilities, and world class skiing combine to make Banff, Canmore, Lake Louise and Jasper perfect for Canadian Rockies ski vacations. The Canadian Rockies offers some of the best downhill skiing in the world, with no less than 5 world class ski hills are within a 40 minute drive of Banff and Canmore — Sunshine Village, Banff Mount Norquay, Lake Louise, Nakiska and Fortress Mountain. Visit our Downhill Ski Area Guide for overviews, lift ticket prices, ski deals and maps for each of these Rocky Mountain ski areas and many more throughout Alberta and British Columbia. The Canadian Rockies area also boasts superb cross-country skiing, highlighted by the Canmore Nordic Centre, the site of the 1988 Winter Olympic nordic events. In fact, whether you plan on skiing, watching wildlife, snowshoeing, photographing ice falls, skating on an alpine lake or dog sledding, Banff and the Canadian Rockies are the place to be. Visit our Accommodations section for an overview of where to stay in Banff, Canmore, Lake Louise, Kananaskis Country, or Jasper. Our Guided Tours and Activities section will show you the full range of things to do in the area; summer or winter. International visitors to the area will want to look at the General Information section for travel requirements to Canada, while the Weather section provides an excellent overview of weather conditions you can expect during your visit. Both the terrain and lift system at Lake Louise are unsurpassed. The area is spread over four faces of three distinct mountains, and lifts and lodges are designed according to the European “ski circus” concept of going “somewhere” as you ski. The ski experience is thus one of constant discovery of new delights, and best of all, because there is at least one easy way down from every chair, the entire huge complex is available to skiers of all abilities. For 71 years Banff Mount Norquay has been the ski area for Banff locals. Just minutes from town, Mount Norquay has everything you need for a great day of skiing or riding, no matter what your ability. Starting with the first ski runs cut in 1926, Banff Mount Norquay now encompasses a wide variety of terrain to suit everyone. Ranging from gentle beginner runs that provide areas to build confidence and skill, up to heart pounding double black diamond runs that will challenge any expert. Take a deep breath and prepare yourself for a grand adventure. In a place where snow comes from Heaven, not from Earth. Where you spend more time on your favourite run than in a lift line. Where the “wildlife” is not limited to party animals, but includes deer, elk, and other creatures. When you come to Marmot Basin in Jasper National Park you’ll understand what it really means to get away from it all. So take a deep breath and come experience what a true mountain ski adventure is meant to be. Big White Ski Resort… the pride of British Columbia’s snow rich Okanagan Valley. Situated only 40 minutes by air from Vancouver. Big White enjoys some of the biggest and best snowfalls available to ski resorts worldwide. 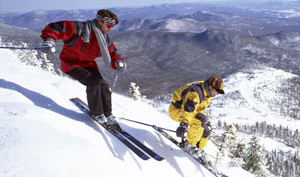 Here you will find over 100 ski runs and glade areas spread out over 2,075 acres of skiing and riding terrain. From treed runs and open bowls to snowboard parks and natural pipes, Big White is a hit with skiers and riders alike. There’s every kind of run for every level of skier and rider. The first resort to be built in the Canadian Rockies in the past 25 years opened December 8, 2000. A place where winter’s bounty is like nowhere else on earth. With snow so sparkling, light and dry it’s been labeled “the champagne of powders.” Located just 14 km from the town of Golden B.C. and the Trans Canada Highway, Kicking Horse Mountain Resort promises to become one of North America’s premier ski attractions and a year-’round, world-class recreational destination. From adventure travel to a family-oriented vacation, Kicking Horse Mountain Resort will offer something for everyone. With the second highest vertical face in Canada and an abundance of natural amenities, your first visit to Kicking Horse Mountain Resort will be nothing short of inspiring. In fact, it will be an experience of firsts. Like your first meal at Canada’s loftiest restaurant at 7,777 feet. A ride on the Golden Eagle Express, Canada’s first level walk-in gondola. And the opportunity to make first tracks in heli-skiing terrain, all for the price of a lift ticket. Silver Star is proud to offer 2,500 vertical feet of top notch terrain. a mild winter climate and truly abundant snowfalls (our average is 18 ft per season). Add uncrowded lift lines, room-to-move slopes and your value per run goes way up. Top it off with a stunning theme village and slopeside convenience – you’ve reached ski holiday heaven. Sunshine Village is located in Canada’s Banff National Park and is an unparalleled ski destination resort, spread across 3,168 acres and three incredible ski mountains. We receive more than 33 feet of snow annually. Our new developed 9,200 foot Goat’s Eye Mountain offers Canada’s finest expert terrain. And, our lifts are the fastest in the world. As a result, you get more for your skiing dollar. Throw in a lot of sunshine, Banff’s only “Ski-in, Ski-out” hotel and a ski season that extends from early November to late May, and the end result is an experience you’ll never forget. In 2008 Nakiska Ski Area was named the official Training Centre of Alpine Canada (ACA). Each year Nakiska, welcomes Alpine Teams from around the world for early season ski training. During the summer of 2008 the ski area embarked on a series of renovations. Snowmaking enhancements increased capacity by 33%. The 100 metre Monster Magic Carpet was added and the creation of a dedicated Training Run was completed on Mapmaker.In 2009, in preparation for the 2010 Olympics, more enhancements occurred. A new High Speed Quad lift was installed (Gold Chair Express) replacing the original fixed grip (Gold) chairlift. The ride time is 4.7 min compared to the old time of 9.7 min. The area has a lot of potential – and a LOT of fans – judging from the emails we get from local skiers – this is a secret jewel in the Rockies – with 863 m (2833 ft) of vertical rising from a base elevation of 1410 m (4800 ft). Rated as 17% beginner, 35% intermediate, and 48% advanced, the terrain covers two bowls and offers some above tree line and cut timber skiing. Westcastle is a good place to develop your leg strength. After skiing down the mostly expert terrain, you then hop on their brand-new Tammarak Chair, a double chair, two T bars or one handle tow that make up Westcastle’s lift service. Yes, this is home grown skiing with all natural snow – AND A LOT OF IT . The season running from mid-December through mid-April. Dreaming of discovering the ultimate snow? It is time for you to visit Fernie Alpine Resort. Ski velvet after a freshly packed snowfall. Link perfect turns across the wide open slopes of Dancer or carve down groomed-to-perfection Cruiser. Pick a special line in the alpine bowls and begin your mountains of snow adventure. Be challenged to the limit. Start your adrenalin flowing on the 2000 foot drop of Skydive, dare to exhibit your talents on the Boomerang, drop into snowpacked trees on Cedar Ridge, or make first tracks in Easter Bowl. No snowmaking here. Just the legendary mountain man “GRIZ” who performs white magic with his powder gun. He is waiting for you in the Spectacular Canadian Rockies. Situated deep in British Columbia’s mountainous interior lies an incredible expanse of skiing terrain complemented by a colourful and warm resort village with amenities to meet your every need. Welcome to Sun Peaks Resort – home to big slopes, big sky, and big sun. We are also big on friendly staff offering stellar service in a relaxed atmosphere – ultimately creating the kind of skiing experience you’ve always dreamed about.